TossTheKey has spent a lot of time reviewing safes recently. We’ve found ourselves saying; “These safes have a lot of great features, but what’s stopping a burglar from taking it from your home?” A lot of safes are fairly light. Or at least light enough for 2 grown men to carry. That might be convenient when you are installing the safe, but isn’t the priority to stop burglars? With the Mesa Safe Co. MBF6032E, 30 Rifle Gun Safe, there will be no worry of people taking the safe from your home. It weighs 670 lbs. The burglars would be better off taking your refrigerator. If you only want a cheap safe to keep your kids from gaining access, you don’t care so much about the weight. If you really want to protect your firearms and valuables, the issues of fire resistance and anti-burglary features become much more important. One of the most important stats on this gun safe’s fire resisting ability is it’s heat tolerance. The Mesa Safe Co. MBF6032E is 1 hour fire rated. it can withstand up to an incredible 1750 degrees Fahrenheit. Most safes can only withstand up to 1200 Fahrenheit. That stat alone is very good for giving you the peace of mind. If the area the safe is in goes up in flames, you don’t really need to worry about losing your firearms. With it’s heat resisting ability it becomes a matter of getting yourself to safety and leaving the safe behind. The safe comes with a load of anti-burglary features. It really is a heavy duty safe meant to withstand everything. The first feature is the electronic lock. With it comes a spring loaded, re-locking device in case of burglary attacks. A lot of locks can be picked by a toddler if given enough time. There will be no worry of kids getting into your guns with this safe. 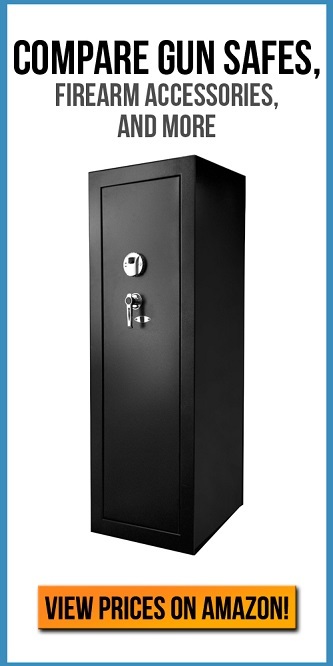 This safe has a Drill Resistant Hardplate to protect the lock. High strength 12 gauge body. 3 x 1” dead bolts and hinges guard the door from being removed with force. There are four anchor holes that allow you to secure the safe to the floor. Combined with it’s 670 pound weight means this safe won’t be going anywhere. The last anti-burglary feature, is the Programmable Time Delay. This adds the level of security protocol commonly used in professional institutions. Basically what that does is delay the time you can perform actions on the lock. So you set it at 30 seconds, that means a burglar will have to wait 30 seconds in between actions. This results in a huge delay when someone is trying to force open the safe against without permission. Total cubic tally on the safe is 13 cubic feet. It’s reported the Mesa Safe Co. MBF6032E can fit up to 30 guns. A really high amount, but perfect for guys with large collections. Adjustable shelves, carpeted lining, it has the works. With the crazy weight on the Mesa Safe Co. MBF6032E, you’ll need to buy your buddies a few beers to get this thing moved. Getting this safe moved around is definitely not a 1 man job. Another important thing to note – with digital equipment comes flaws. Make sure you store the spare key provided by Mesa Safe Co. in a safe spot. Also keep some batteries on hand. You don’t want to get one morning to go hunting, only to be locked out of your safe. Taking all these points into consideration, this is a very heavy duty safe that provides peace of mind with a great fire rating. It would remain intact if the floor collapsed in a fire. Now all you need to do is decide where to keep the back up key.